One day at school something caught Louis\' eye, something that made his heart leap. It was a toy Gypsy Moth! There was no one with it. 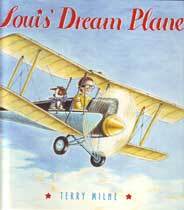 Louis spun the propeller and pushed it slowly across the playground, imagining it taxiing towards a runaway. The little wheels rolle faster and faster until... Whoosh! The Gypsy Moth took off with Louis in the Pilot\'s seat. Children Literature: 26 pages, HB w/ dust jacket, illustrated, 8 x 8in.